So far I have covered the the basics in terms of setting up groups and operations as well as what you need to know to effectively run auctioning and shopping scans. These are by far the most important parts of TSM and we will continue to dive into the intricacies of operations later. For now we will head to another part of TSM, the dashboard and the ledger. I will show you how you can use these views to analyze your performance. The dashboard is where you end up if you type /tsm in chat. 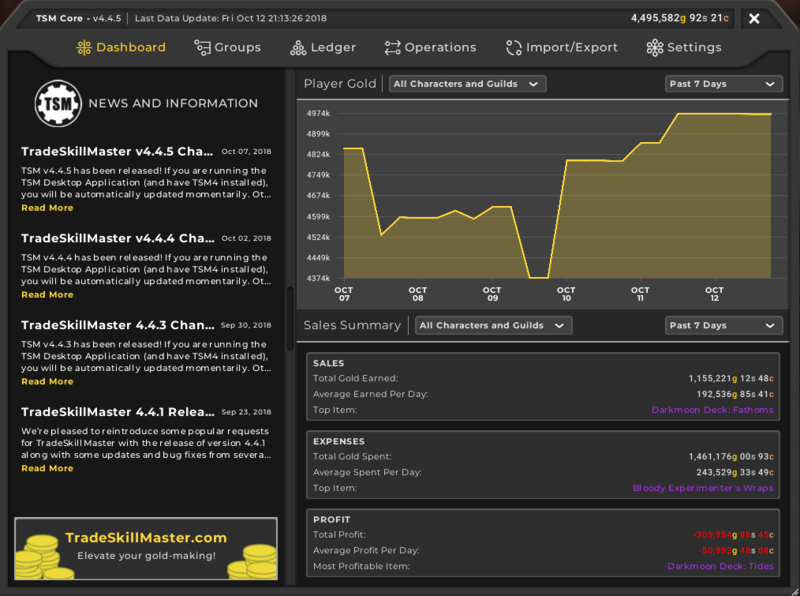 It will show you a graph of your total gold as well as a summary of your expenses, sales and profits. You can choose a time frame to only show your performance over a smaller time period. The Sales summary will give you a great overview of how you are doing, especially on a week to week basis. Comparing your last month to your last week is a great way to get a quick indicator on your current direction. Are you doing better or worse than your longer run average. Especially the daily averages are nice to compare to see how you are doing. I don’t think the last day is interesting, as it is a time frame that is just too small. 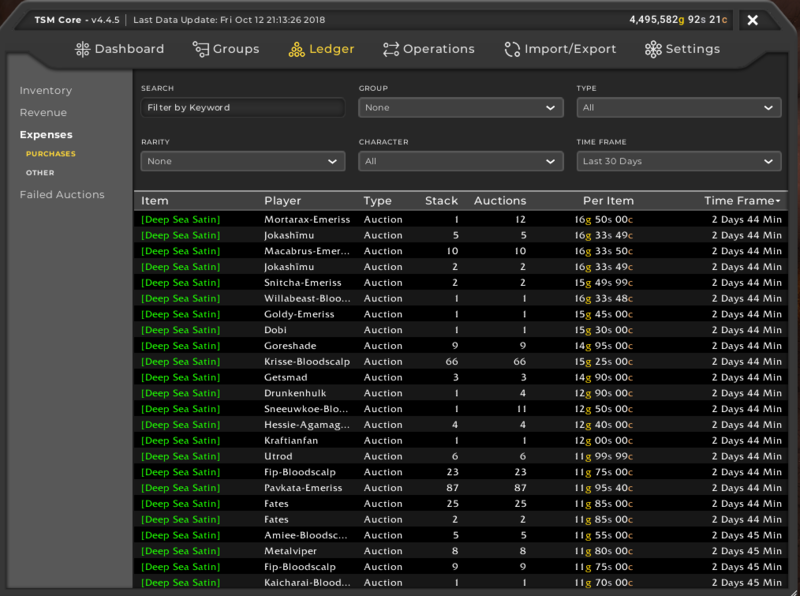 The ledger contains all the historical data on your transactions that TSM has logged on your trading activities. This includes all of the auctions you have sold as well as all auctions you have purchased. 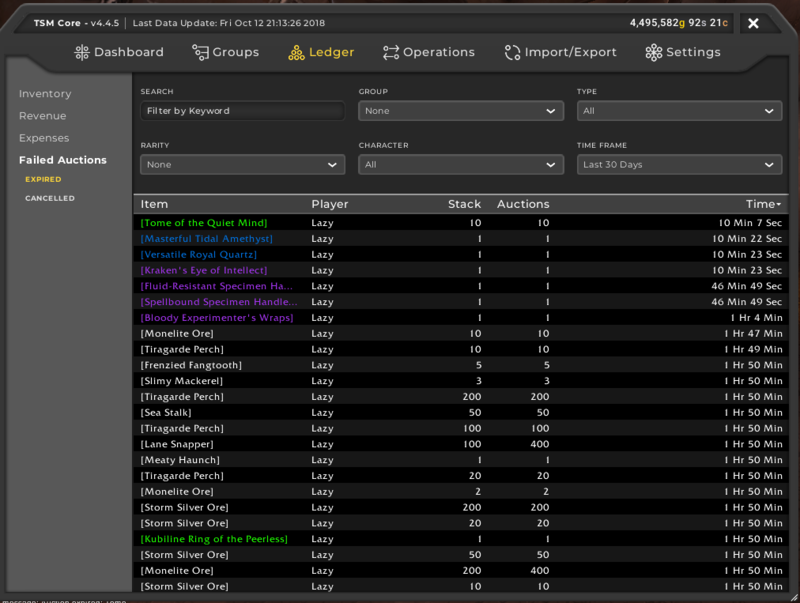 It also contains an inventory viewer that contains data on all the items you have across all your characters and guilds. This makes it an invaluable tool in terms of figuring out what markets work, and which do not. The ledger is found in the main TSM window. You open it by typing /tsm as usual, and you can find the ledger as one of the main menu choices. By default you will be shown to the inventory view when you open the Ledger. You can navigate between the various Ledger views by using the menu on the left. The Inventory View is fairly self explanatory. The main option you can choose is what price string or value source you want to use to determine the value of your items. By default it will use dbmarket as the value and the items will be sorted alphabetically. You can filter items by using keyword searches or by choosing one of your groups, it will then filter out anything not in the sub groups. This can be used to quickly get an overview of the total value you have in certain groups as well as the most valuable parts of your inventory. I suggest sticking to dbmarket to value your stock in most cases. 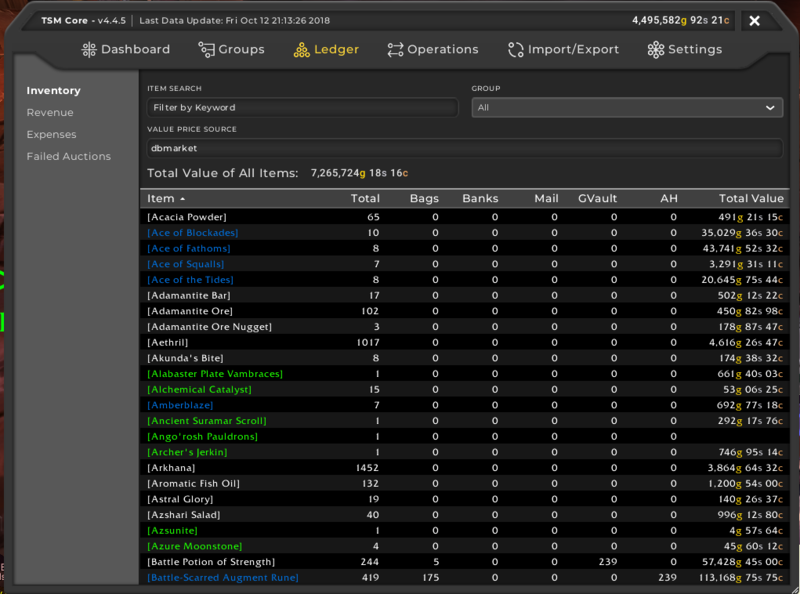 As an example you can see that I have about 730k worth of BfA materials when I filter out just my raw materials group. Under Revenue you have three views, where two of them are incredibly useful: Sales and Resale. Sales will give you a list of all your sales that have been tracked by TSM. 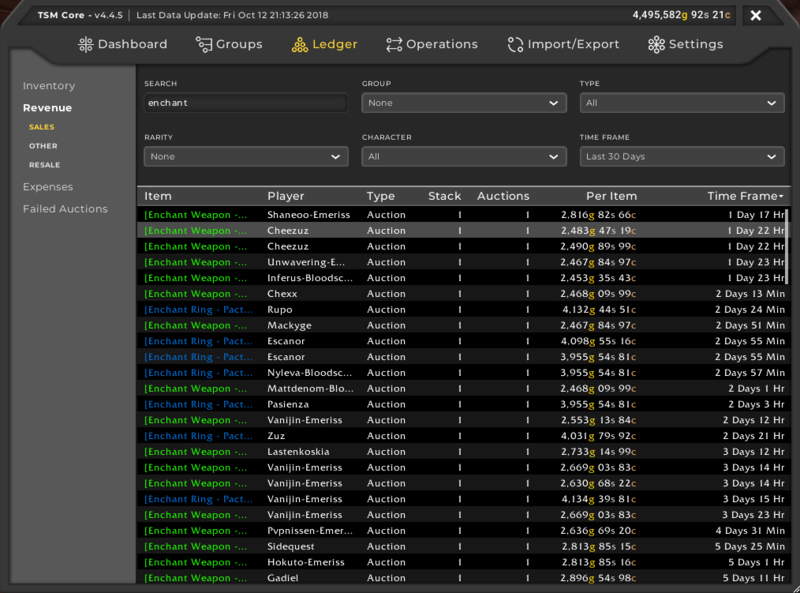 You can use various filter as well as sorting by name, stack size, auctions and item price. You can also look at just your last 7 days for instance. I use this a lot in my gold cap challenge to see what items sell. I am especially interested in the most valuable items I sell to make sure that I restock them regularly. The other interesting view here is the resale view. This will give you an overview of all items that you have both purchased and sold in the chosen time frame. This is great for figuring out how well you are doing with material flipping. Items will only show up here if you have both revenue and expense records for the item in question. Both views have the same set of filtering options. I use both the last 30 days and the last 7 days to look at my markets, and I will typically filter by group in the resale summary to quickly look at my material groups. You can also use any of the column to sort the views, and this functionality will be the same across all the ledger views. I typically do not spend a lot of time in my expenses view. It will show you a purchases summary that is analogous to the sales view with a list of all of your purchases including prices. 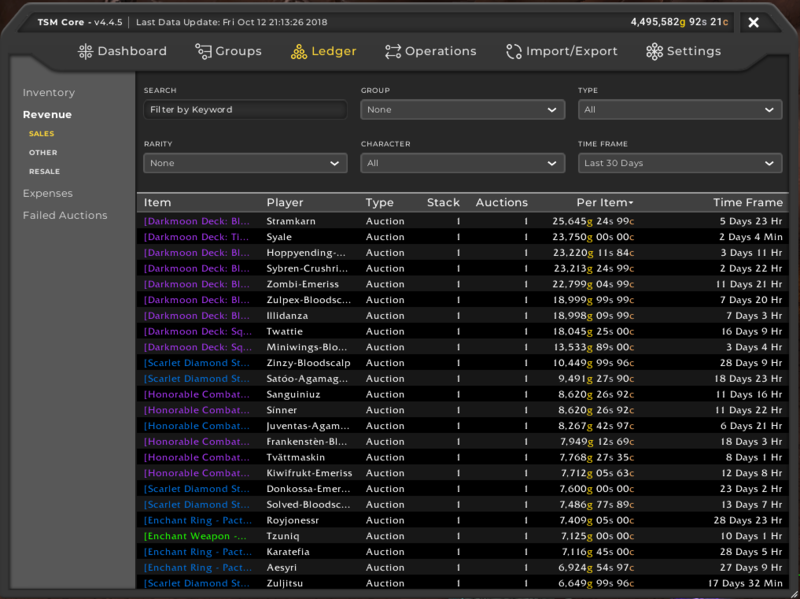 You need entries here to calculate your avgbuy price source as well as for resale profits, but the view will not give you a good idea of where you are spending your gold as it is just a list of auctions, and there are no options for aggregation at the moment. The other Tab will include miscellaneous expenses, mostly postage, repairs etc. The last view contains two list views of all of your failed auctions. One view each for expired auctions and cancels. This is used to populate the value source numExpires that is useful for figuring out if you should just vendor an item, as after a certain point you will have spent so much in deposit cost that you should just cut your losses. The actual views do not give any good insights into your auctions and I do not personally use them for anything. By far the most useful views are the revenue views: Sales and Resale. These two together with the dashboard will show you everything you need to know. I like to look at my average daily sales on a weekly basis. If my average sales are trending down it’s time to figure out if it’s because I’ve run out of items in a certain market. Head to revenue to see what your high value sales are. You want to pinpoint which of your groups have been slowing down, and what the cause is. If you are trending upwards you will just want to focus on selling more of your high value sells and your high profit margin flipping markets as seen on the resale summary. If we look at my dashboard we can see that my top item is darkmoon deck: Fathoms. So if I haven’t sold one of these in 4 days, then I will want to make sure I have them in stock, and if I have them in stock, it’s time to look at my settings. A good start is to sort your sales by the per item value. Then you start scrolling. Here we can see the range from 6k-24k per item for me over the last 30 days. This contains darkmoon decks, JC staves, honorable combatant gear and enchants. I can then drill down on one of these by searching in the filter bar, for instance for enchants. Now I want to sort by time frame to see if I am still getting regular sales. We can see that my sales are very regular, and everything indicates that the market is still doing great for me. I definitely want to keep stocking enchants at my current rate as they are selling regularly. Thus I will keep buying materials and crafting enchants, both for rings and weapons. The Ledger and Dashboard are invaluable tools to figure out which markets are working for you. I highly suggesting checking them at least once a month to make sure you are on track. Checking in every week is great to make sure that you are keeping your items in stock and that you are getting what you can out of your high value markets. 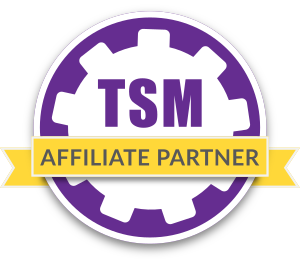 Does tsm use crossprofile to give the sales and expanses. 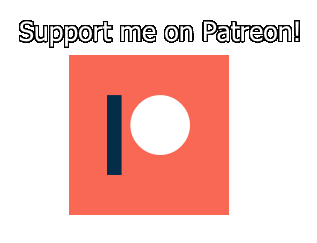 And thank you for your blog, really interesting thoughts in there. Thanks for the great guides, these are awesome! Do you believe AH bots are out there these days? I have this guy on my server that undercuts my professions market within a few seconds, always and at any time. There may be botters out there. I have no knowledge of botting though, so no idea what botters could potentially do on the auction house. Have you had issues with the ledger not recording transactions properly? For example, today I sold a few enchants on my priest, and they were in the ledger while I was still logged in. However, after I logged out and closed the game, then reopened it, they were missing. Also, I sold a whole bunch of pigments yesterday, and they are missing from my ledger as well. My guess is that the addon keeps recent transactions in a buffer in memory or something, and only writes out the buffer to permanent storage every so often. Have you encountered a problem with this? 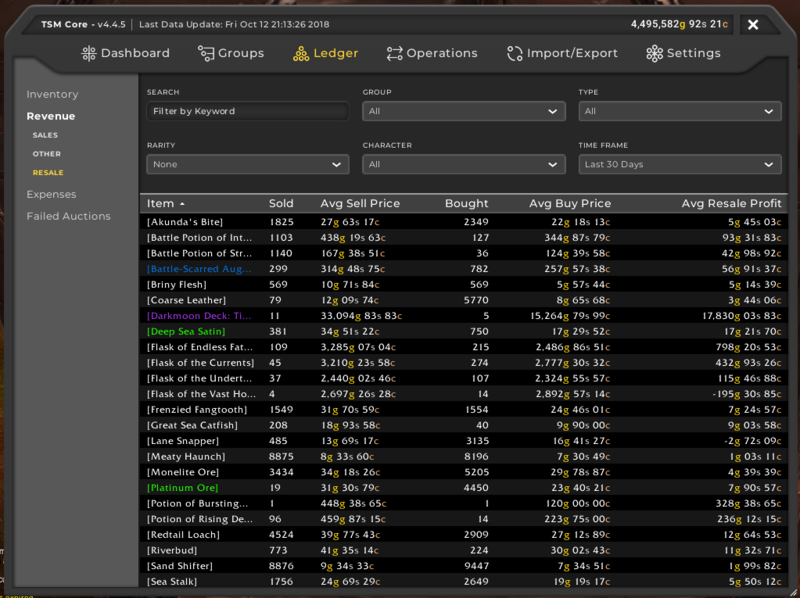 It messes up how much profit I am making, as well as the avgbuy metric that I use in crafting to figure out which items to sell to make a profit. I have had issues with that yes, not sure if it’s a known issue, but I’ll report it to the TSM team. I have no idea what causes it though, but it is quite annoying.